In my previous blog post "Highlight items after every change", you have learnt how to apply highlight the tasks after every change by using Visual Basic for Applications macro. Best practice followed when linking tasks is (a) Don’t link summary tasks to summary task – as it complicates the scheduling logic, (b) Every other task should have at least one predecessor or successor task. It is easy to validate the above provide your plan is small (this is quite relative again 🙂 ). 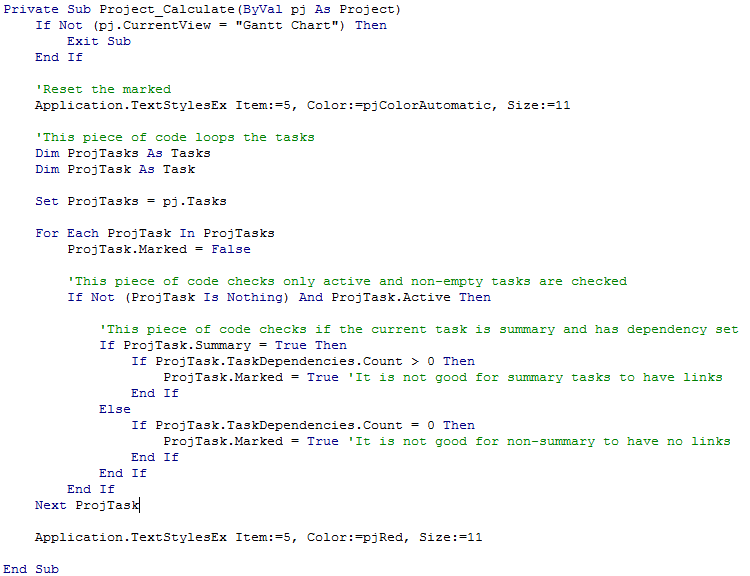 In this blog post, I will walk through on how VBA macros can color tasks automatically with no dependencies set and color summary tasks with dependencies set. Let’s start with a pseudocode for this requirement. 1.1.1.1. If number of dependencies is greater than zero, then mark it. Now you need to translate each statement by using Project model object, properties and methods. 2. In the editor, double click your current project on the left panel. 3. Now change the object and procedure to "Project" and "Calculate". 4. This will include a private sub-routine which will be invoked automatically after calculation!! The above sub-routine checks if the current view is Gantt Chart. Then, it changes the text styles of marked tasks (Item:=5) to default color. Then, we loop through the task list and mark the tasks having the issues. After closing the editor, I just retyped a task information and Project automatically colors the task that need attention in red.